February 11 is a holiday in the Vatican. It is the day when the Holy See celebrates the settlement in 1929 of the so-called “Roman Question”, the resolution of the 59-year stand-off between the Kingdom of Italy and the Holy See after the fall of Rome in 1870 to the Kingdom’s troops and the effective end of the ancient Papal States in central Italy. By chance it was also the day Pope Benedict XVI chose to resign a year ago. The date had been scheduled for a small consistory, comprising midday prayer and the announcement by Cardinal Angelo Amato of some beati due to be promoted to saints. There had also been a little gentle buzz for some time in the Roman Curia about the Holy Father announcing one or two important changes then, perhaps near the top of the administration, but these kinds of rumours circle like the seagulls around the Vatican’s Belvedere: they come round frequently, make a bit of noise and go away again. In other words, as in most places, nothing happens until it happens. There was no indication that this day was going to be any different. It was also a holiday, and although the rest of the Curia was enjoying a rest, the few people around the person of the Holy Father, including myself, were to be on duty in the Apostolic Palace’s Sala del Concistoro to welcome him as he went to pray with the cardinals present in Rome and to go through the short ceremony. As a Prelate of the Anticamera, a kind of aide de camp, who assists the Holy Father’s principal guests and makes sure everything goes according to plan when the great and the good come to call, I met the Holy Father before the ceremony began. As usual he came down by a private lift from his apartments with Archbishop Georg Gänswein and Mgr Alfred Xuereb, his two secretaries. He looked well but tired and greeted us in the usual way. As this was a day of particular solemnity, the Master of Ceremonies was present. Archbishop Guido Pozzo, the then Almoner, was also there. 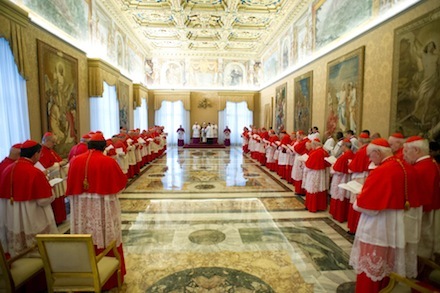 Once the Holy Father had been readied for the Liturgy of the Hours, we all followed him into the Sala del Concistoro to pray with the waiting cardinals. The Holy Father then took the floor. This was the first time I had sat in a consistory, so I had no idea if this was normal or not. He spoke in Latin, so a greater effort than normal was going to be required by all of us – Italian being the normal language of the Curia – so a little strain was evident as we tried to grasp where he was going. Within seconds it was clear what was happening. This was no ordinary address. He did not speak about the consistory and the soon-to-be saints, or a few changes in administration, or the anniversary of the Lateran treaties, or the end of the historic dispute with Italy. Instead, he made history. I felt my stomach turn over as I realised that here before us was something not seen for centuries: the voluntary resignation of the Roman Pontiff. It seemed that, in slow motion before me, an assistant television cameraman put his hand to his mouth in a cartoon-like gesture of astonishment, the monsignor sitting next to me started to sob quietly, Archbishop Gänswein’s shoulders seemed to drop. The cardinals leaned forward to make sure they understood precisely what was being said and I found myself checking that my jaw wasn’t dropping open. Then there was silence. After a pause, the dean of the College of Cardinals, Cardinal Angelo Sodano, stood up and took the floor. I don’t remember precisely what he said, but it was brief, calming and apposite. It was clear he had been informed beforehand and had prepared a few words. By contrast, the faces of the cardinals showed that they had had no warning of what was to come that morning. After Cardinal Sodano had saluted the Pope we followed the Holy Father back out of the hall. The choir attempted to sing an exit song of some kind, but it all seemed a little out of place now. I looked round to see the cardinals gathering in a small circle where we had left them. They looked at one another in stunned silence. The Pope had announced that he would step down some three weeks hence, but it already felt like the end. We followed him to the lift that goes up to the private apartment. Normally this is done in quiet dignity. This time it was in silent shock. At the lift he turned to greet us. Our usual parting words – “Until tomorrow, Holy Father”, “Have a good lunch, Holy Father” or “Happy feast!” – simply didn’t materialise, I don’t remember being able to say anything to him at all. We shook his hand in silence or mumbled something inaudible. As I held his hand I thought he looked very old and very pale. Then he was gone. I turned to one leading layman in the group, shook his hand and said: “Ora, cosa facciamo?” (“What do we do now?”) He gave no reply to this. From that day on until February 28, the last day of the pontificate, Pope Benedict’s schedule just got faster and faster. It seemed that everyone wanted to come and say goodbye to him. Extra meetings were scheduled, even in the evenings, so that he could see everyone who wanted to come. But up until that point it felt almost like a death foretold. On the second to last day of the pontificate, there was the Pope’s final general audience in St Peter’s Square. Here was another thing that had never been seen before and one of the most moving things I have ever witnessed. Instead of the usual crowd of pilgrims, curious tourists and visitors, here was all of Catholic Rome in the square, come to say farewell to the Pope. In my role that day I sat behind the Holy Father and had the same view as he had out across the square. It was a cold, bright and beautiful day. The audience started normally enough in the circumstances. The Holy Father gave us his farewell speech and we all listened. St Peter’s Square turned attentively towards Pope Benedict. Here was a huge group of people – at least 100,000 of them – listening to every single thing the Pope said with the greatest attention. Given the great, self-denying service that this shy Bavarian gentleman had given to the Church, it has since felt to me that he deserved to see and feel a little of the great gratitude of many people throughout the world for his having taken up the great cross of leadership in the Church, for having persevered under the heat and sweat of the day, and having even chosen wisely the right moment to put that terrible burden down. On February 28 I joined many colleagues from the Secretariat of State in the Courtyard of St Damasus at about 4:30 in the afternoon. The Holy Father came down to the courtyard, waved a farewell to us, gave us his blessing. We applauded him in a subdued but supportive way as he was driven from the courtyard, and it was with very mixed feelings that I went back up the stairs to my office to watch on television the rest of his journey into exile. Although a very poignant moment, Rome rarely looked more beautiful in the grey-blue wintry twilight as the helicopter taking the Holy Father to Castel Gandolfo was filmed from another aircraft. The man who appeared briefly afterwards on the balcony at Castel Gandolfo looked so haggard that none of my colleagues expected him to last many more weeks. Happily, though, I was later able to see Benedict XVI, well again, one more time before I left Rome. Some six months after his resignation, in August of last year, he asked to see me at the little Vatican monastery which is his new residence. He wore a loose white cassock without the sash, and walked with his usual stick, but he was well and relaxed, and looked happy surrounded by his old friends: his considerable library of books. He also had his colour and his smile back. We talked about Edinburgh and about some of the times we had worked together, especially his state visit to Britain and its various moments, including his meeting with the Queen, which had started the visit so successfully. It was good to know that there was a happy conclusion to the Calvary that I had seen Pope Benedict mount the day he had announced his decision to leave the papacy. I sometimes ask myself, in 100 years time, how many people will be reading the corpus of writings left by Joseph Ratzinger? 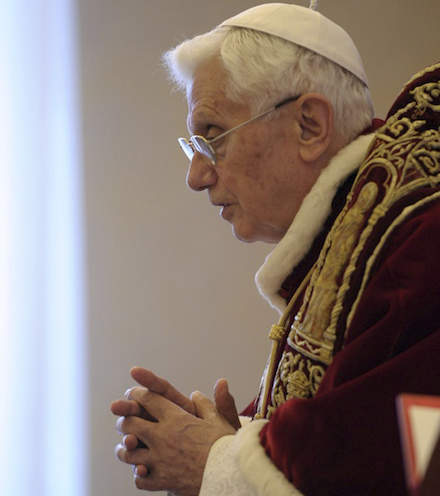 But I think already there is little doubt that the bold and wise manner of his departure will assure Benedict XVI a special place in the history of the popes.